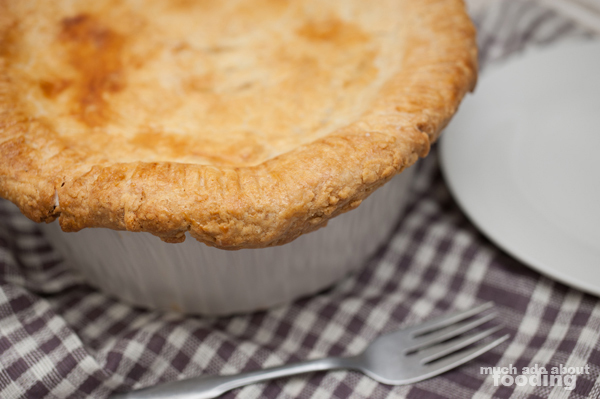 It may be summertime but that doesn't mean that sometimes, you just want a nice hearty pot pie. Any season is good for it! I grew up right next to a Marie Callendar's and while my parents weren't too keen on us going out for food, every once in a while during high school and when I was back home from college on breaks, my friends and I would mosey on over if we were hanging out at my place. It was easy to do - cross the street and you can find yourself with American "comfort" food. Something that we had had in the house often were the frozen mini pot pies that Marie Callendar's makes; that was an easy favorite growing up (hush about the sodium content!) but nothing beat having it fresh from the restaurant. I've always wanted to make it myself though, and it took a long time to find the occasion to because I wanted to do everything from scratch. Yes, even the crust. There was also the matter of getting the correct bakeware; I'm a bit particular about my ramekins. Pot pie also turned out to be one of Duc's favorite things to have so the pressure was on. We finally put one together after finding the perfect dish, and it was glorious. Flaky, buttery crust enveloping a creamy, loaded center...yes. 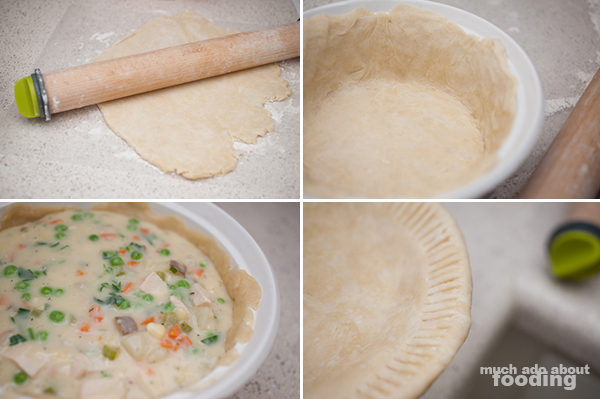 Follow the recipe below for this chicken pot pie from scratch. This is the longest part of the recipe process. The prepwork always seems to be. Is this why people have prep cooks? Anyhow, dice and chop everything as needed. I used rotisserie chicken breasts from Costco because I wanted to get their skin's roasted flavor in the meat but you can use your own poached breasts as long as they are cooked prior to adding to the pot pie. 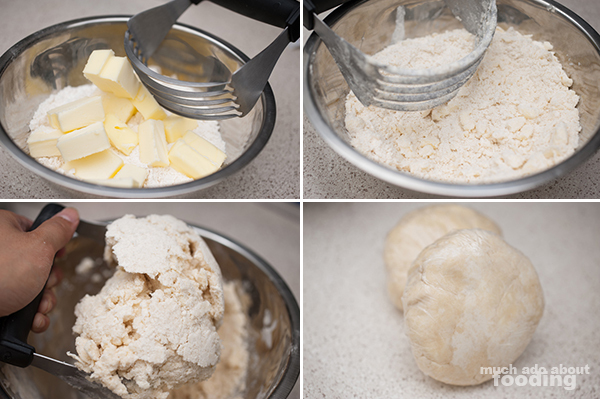 Prep the pie crust accordingly and refrigerate. I would say you should do this before starting the other prepwork so they can finish at the same time. 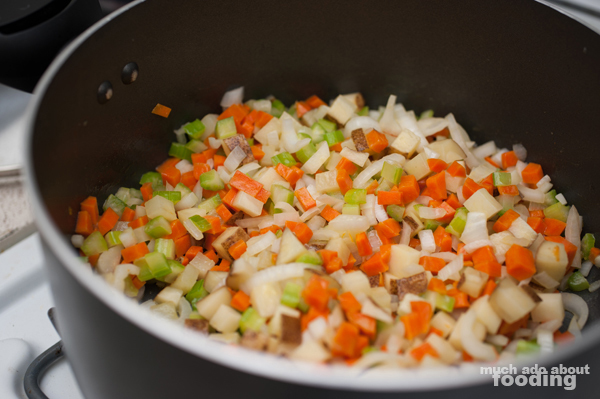 In a large pot, add 3 tbsps of the butter with carrots, celery, and onion on medium heat. Sweat them out until the celery and onion are barely translucent but haven't browned. Add garlic salt, pepper, and potato with remaining butter. Melt down until potato have gotten translucent around the edges. 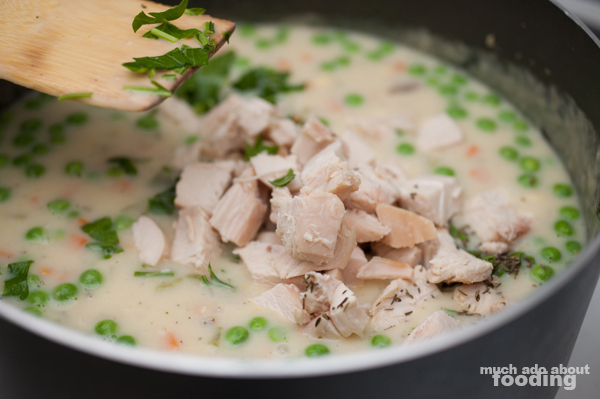 While you're waiting on that, heat up 3 cups of chicken broth in a small saucepan. 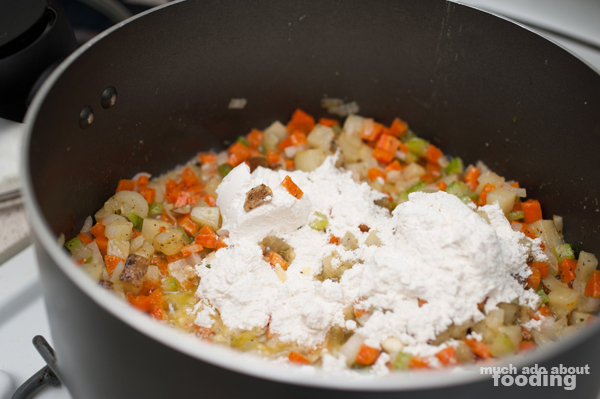 Into the large vegetable pot, add in 1/2 cup of flour and stir rapidly to remove lumps. 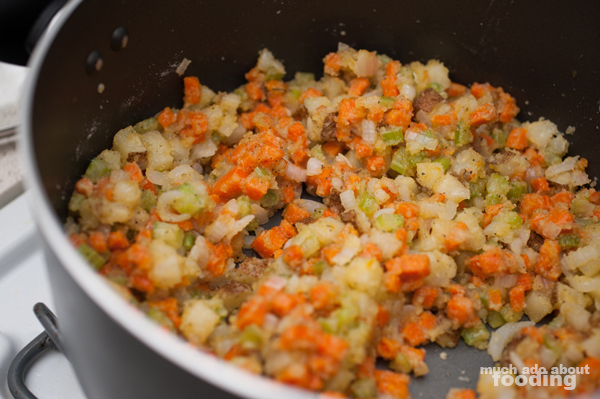 It may look like stuffing. Pre-heat oven to 375°F. 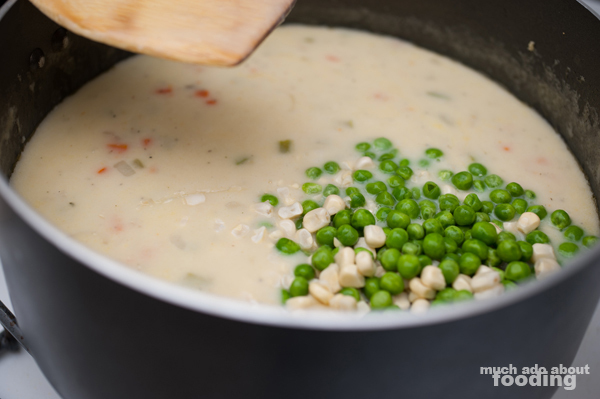 To the large pot, add in whole milk slowly and hot broth, stirring the whole time. 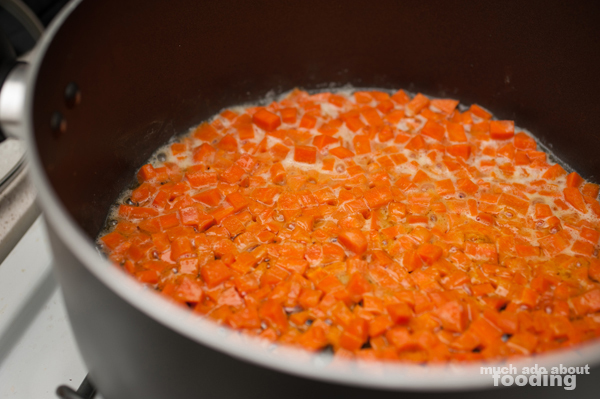 You'll want to let this simmer on medium low heat, covered, for 10-20 minutes until it's the right consistency you prefer. 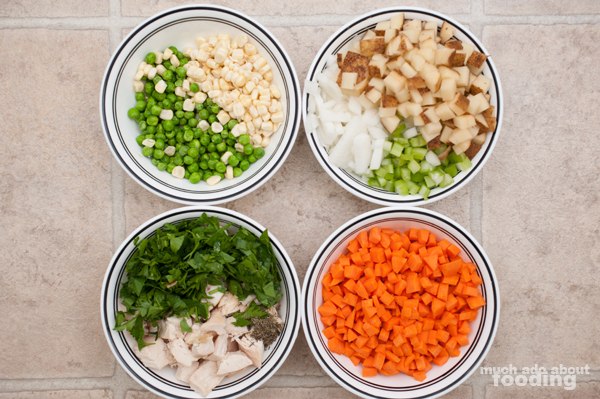 When ready, add in peas, corn, chicken, parsley, and thyme. While the pot is simmering, you can always take out the pie crust and prep it by rolling it out. I used a 1 1/2 quart bakeware dish for my pot pie. I lined it with the bottom crust, put it into the pre-heated oven for about 5 minutes, and then poured in the filling. You'll have plenty of filling left over by the way. Then I placed the top crust on top, used fork tines to crimp and seal the edges. 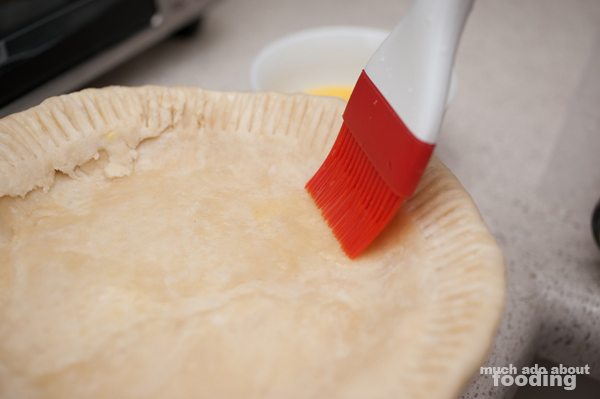 If desiring a golden brown finish, brush the top of the crust with an egg wash. DON'T forget to slice a few vents on the top crust for hot air to escape! I nearly did, whoops. 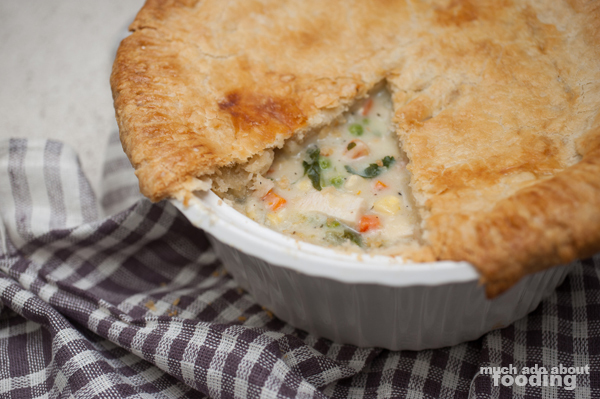 Pop the pot pie into the oven for 40-50 minutes; the crust should be a golden brown. When ready to remove, let it sit out for several minutes to cool a little. The interior will be extremely hot. Enjoy!